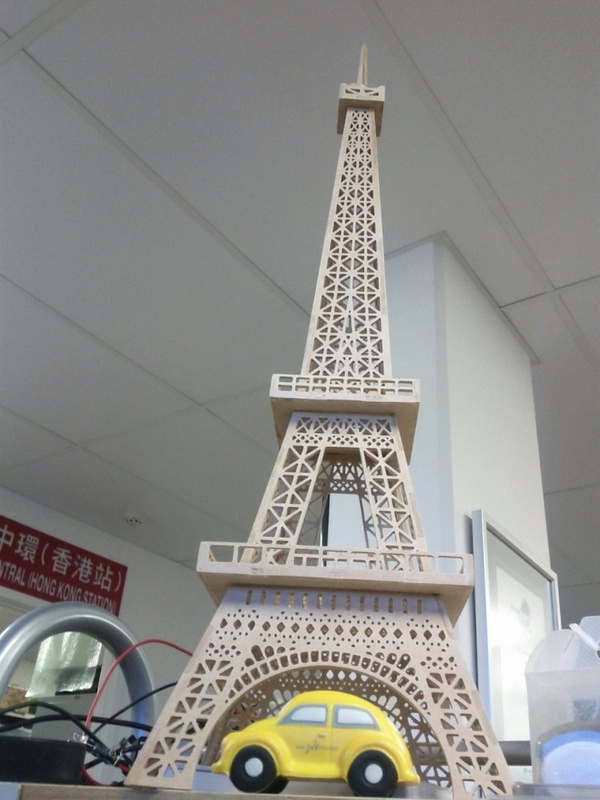 Here is a model of the Eiffel tower I made using a 3040. Model sits about 65cm high and was cut with a 1.5mm single edge straight cut bit. About 24 hours of machining involved but fantastic results! What wood did you use? Ply, 3mm? Any chance of making the .dxf available? I used 3.2mm MDF. It didn't cut particularly well to be honest but I am very green wrt machining so it was very much simply a learning exercise (with great results!). The original model was essentially split into three 300x350ish sheets although the third sheet was too large for the 3040 so for any one else wanting to make this model, put the 2nd tier edging bits onto the side of the first sheet! Plus if you're going to use MDF like I did, see the comments below about modifying the model! Although I had to do a few modifications in particular with the peak (the MDF just couldn't handle such a sharp point and just turned to fluff. I made them a little wider at the top then just sanded them back to make the point) and the holes in the sides of the edging on the 2nd tier were too large making the part in between turn to mush. I'm sure if i'd used a harder material it wouldn't have been an issue.